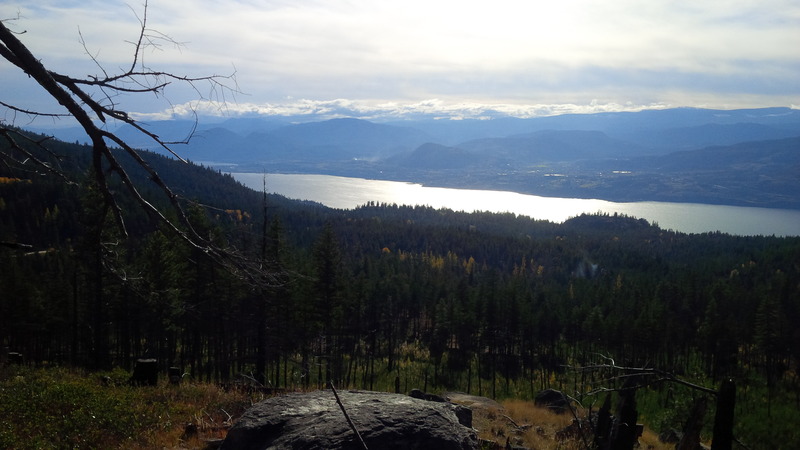 Yesterday, M and I went for a hike in Okanagan Mountain Provincial Park. It had rained earlier in the day, but when we got started at about one pm, it was bright and sunny with that sharp clarity of fall light. 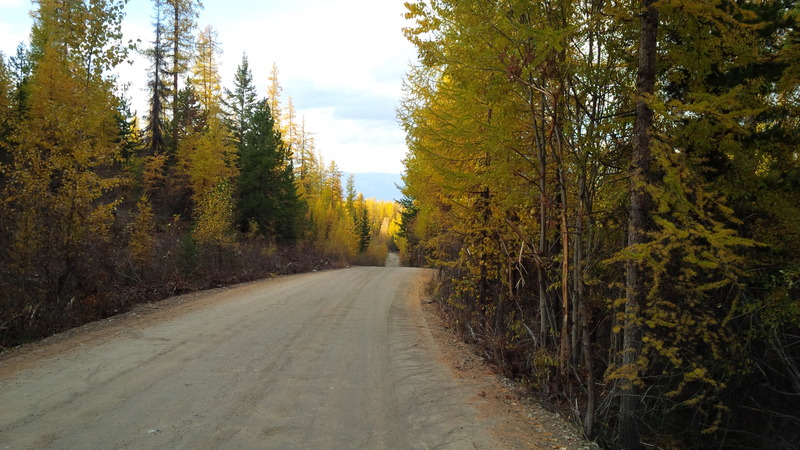 We hadn’t hiked here before and found ourselves in the midst of a spectacularly yellow aspen forest. 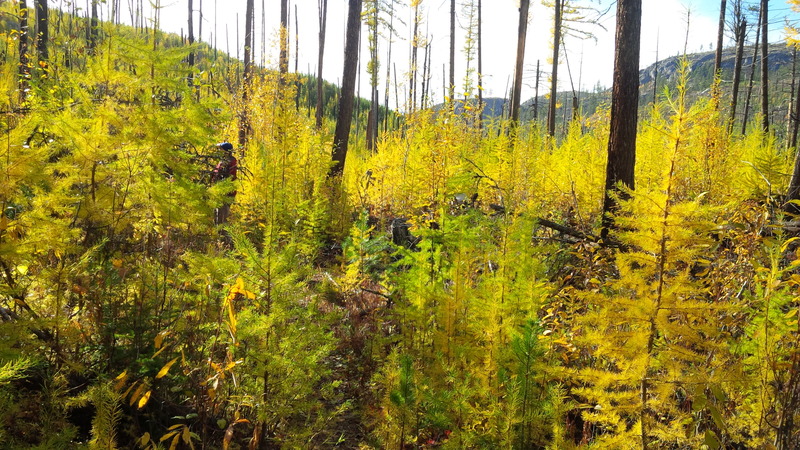 This forest is recovering from a large, ravaging fire that occurred in 2003. It’s amazing to see some surviving giants, seriously scorched at their bases, but still growing. The present, the past, and the survivors. 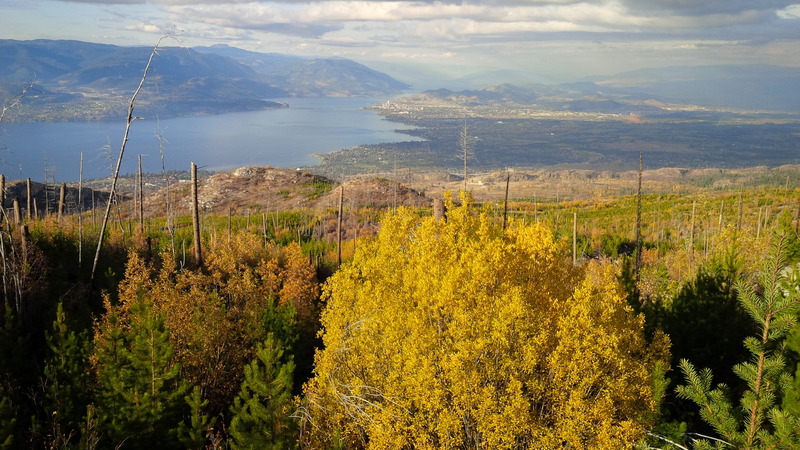 We climbed through the forest and up to a lookout over Lake Okanagan. We finished out the day with a drive along an old railway track. This afforded us some impressive views; we were stopping every 10 metres! The city of Kelowna is in the distance. The old railway tracks have been removed and the remaining trail is used for hiking, biking, or creeping along in a truck, as we did. 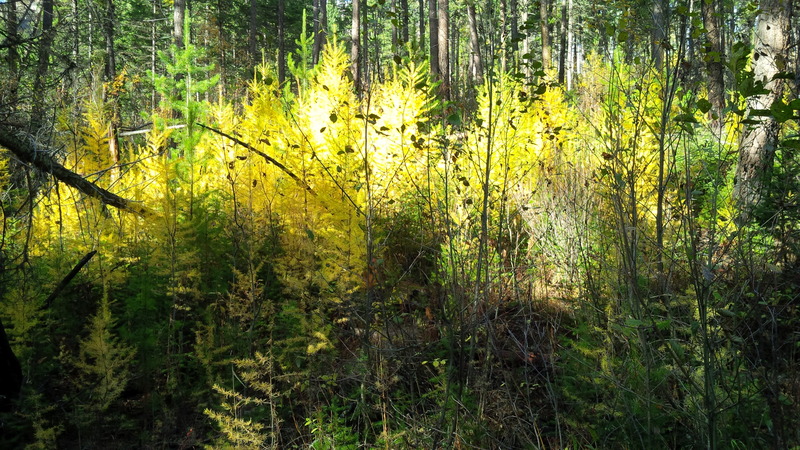 Forest that escaped the fire. M and I have experienced some additional life stuff lately and so a day like yesterday was truly fabulous! Wow! Your photographs are amazing, Lynette. Thank you so much for sharing them. I hope all is well with you. Hi Jill, thank you very much. 🙂 Yes, I am fine. Thanks for asking. I’ve just been very busy with job upheaval and am still in the middle of that. The uncertainty has been kind of nuts-making and stressful but we’re otherwise fine. It’s funny because I was told back in the spring of 2015 that I would undergo a long period of change that wouldn’t settle until the spring of 2017. Seems to be turning out to be true! I’ve been through job upheaval…no fun at all. Lets hope that period of change will settle sooner rather than later. Take care, Lynette! 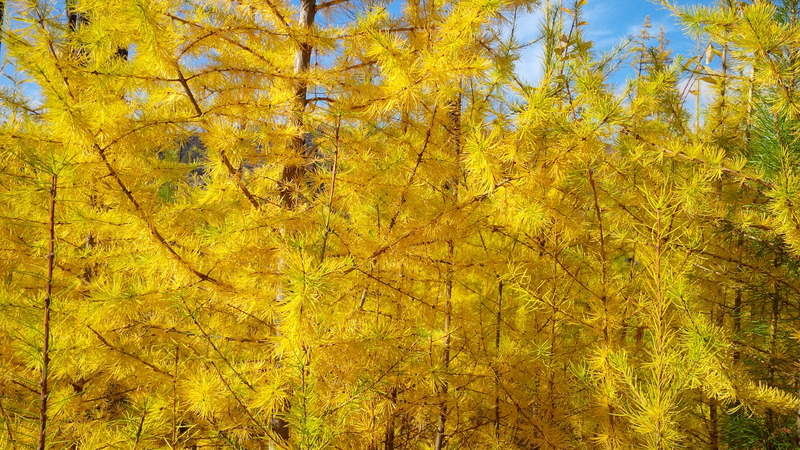 That yellow forest was such an amazing surprise. It was actually sort of glowing, a quality that I’m not a good enough photographer to capture. Wonderful pics Lynette! 🙂 Looks like a great day.